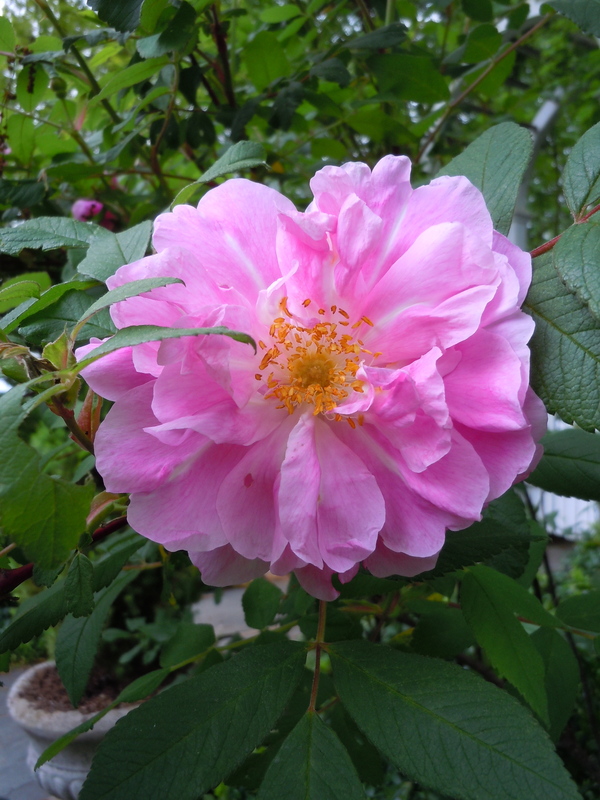 My earliest rose blooms in May, faithful Theresa Bugnet. 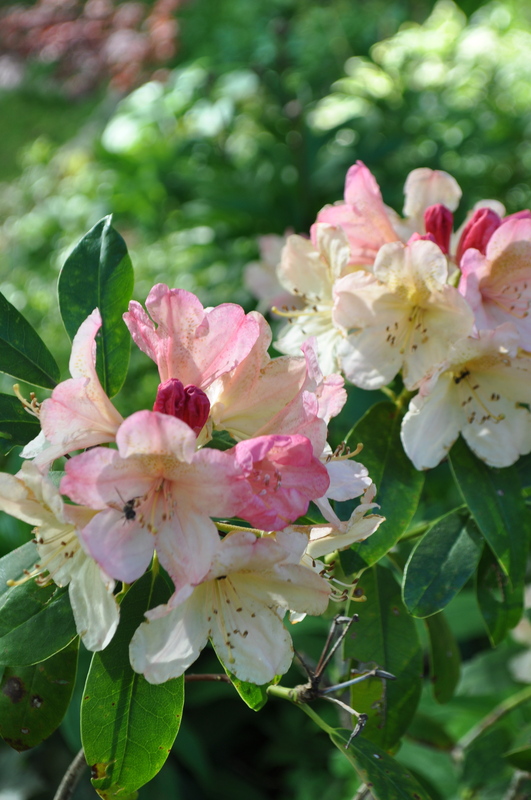 The rhododendron have begun to bloom. A lost name, but I remember well the trip to watch a college lacrosse game when I made a detour to a beckoning nursery and found this. As sweet as this bloom appears, I hear and see the heat and excitement of a lacrosse game when I look at it each Spring! 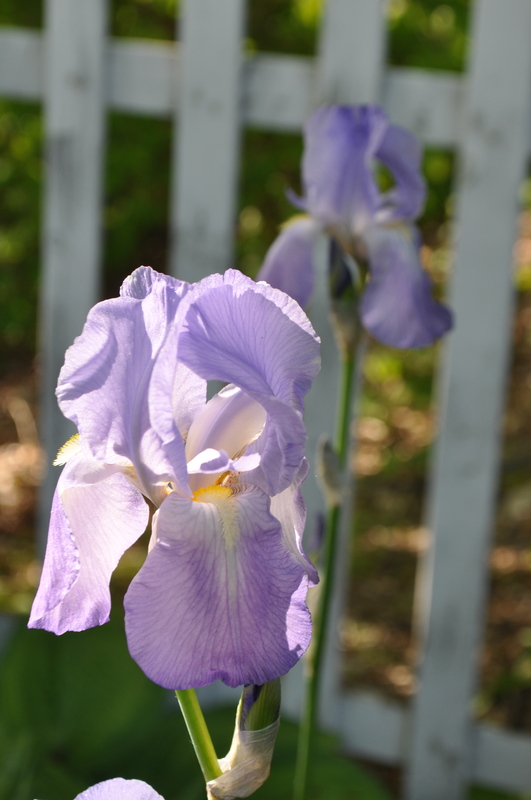 I’ve lost this Iris’ name but each May, its grape jelly scent and clear blue color remind me of a dear friend who moved away many years ago. 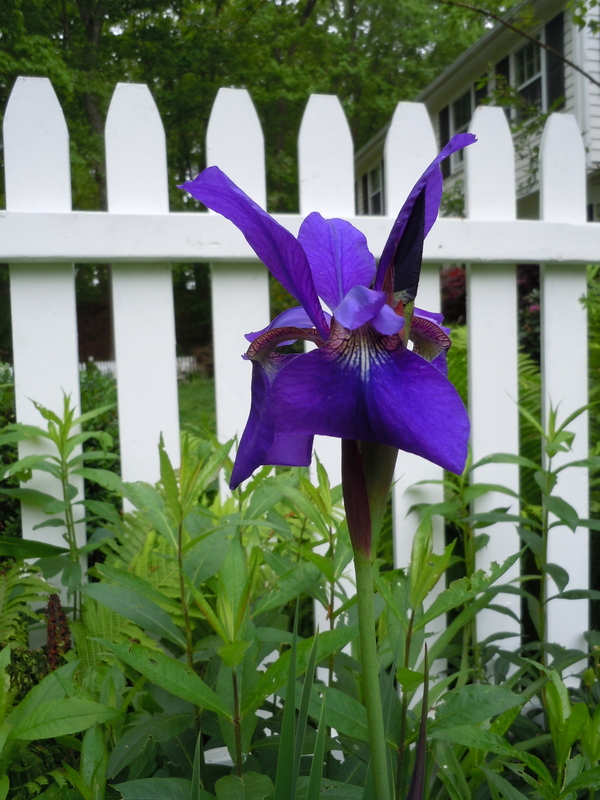 This iris had been in her CT garden long before she gardened there, and now it blooms in both CT gardens. Purchased for its name, ‘Josephine’ disappeared last year, but it has just appeared again, surprising me as it grew through a Manhattan Euonymous unnoticed until this early Spring day. Like my Aunt Josephine, this vine is one of a kind! My Aunt raised goats, and could be perhaps the reason for my life long but unfulfilled desire to raise goats! She lived in a rambling antique house set on a rolling landscape near the Croton Reservoir. 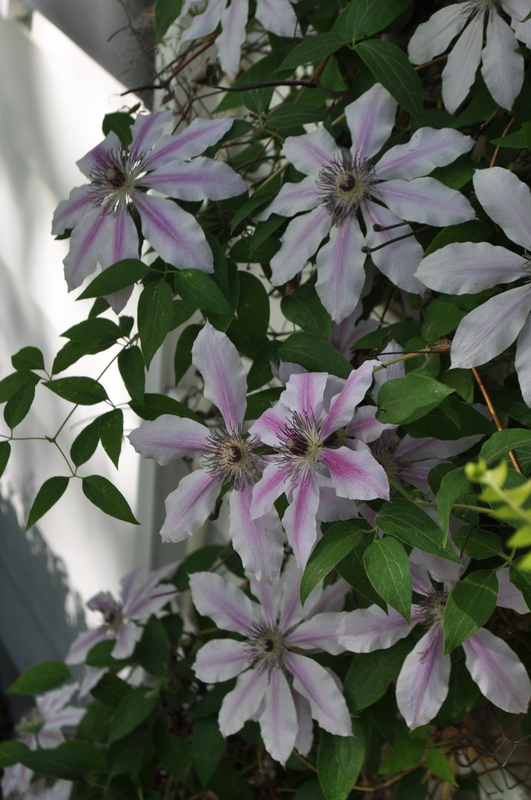 Like the clematis, she has disappeared from our lives, but she appears in happy memories, often unexpected. 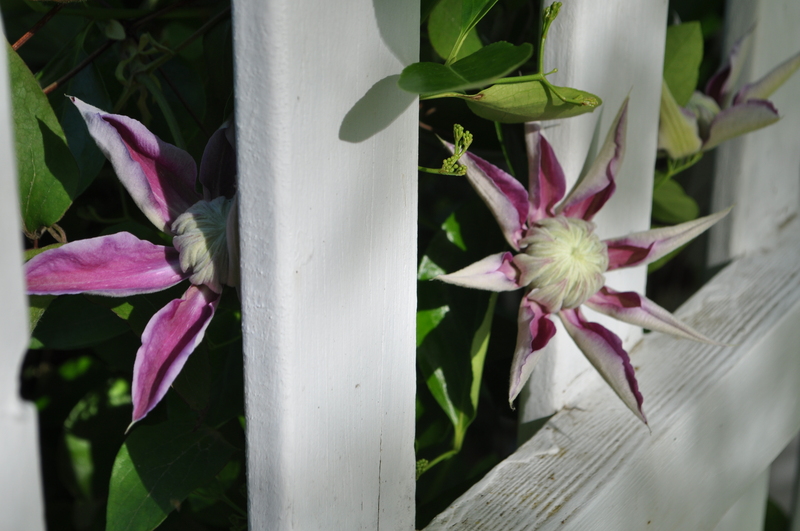 Nelly Moser is another clematis, blooming at the front door this May. 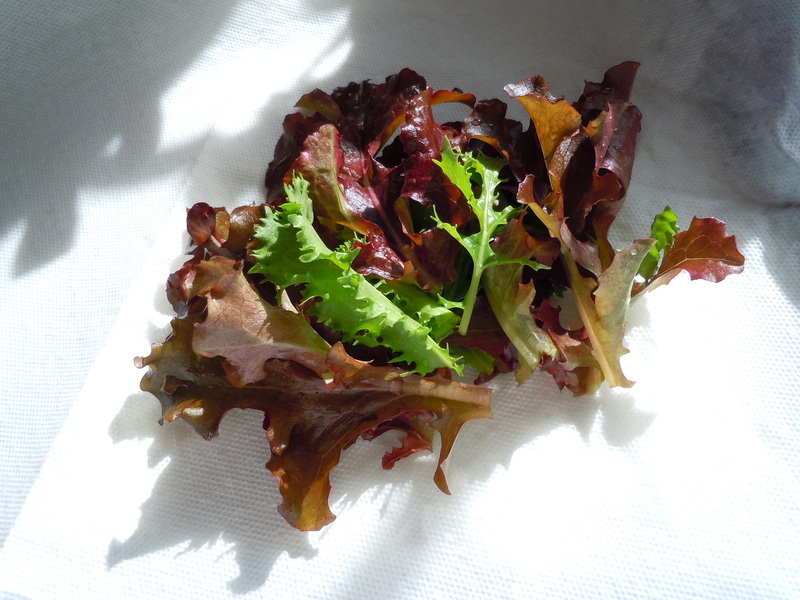 Aside from flowers blooming in May, I am starting to harvest the young lettuce! And though the outdoors commands my waking hours, I cannot neglect the indoor plants, particularly the begonias. I’ve just received a new box of babies from The Violet Barn. Highly recommended! 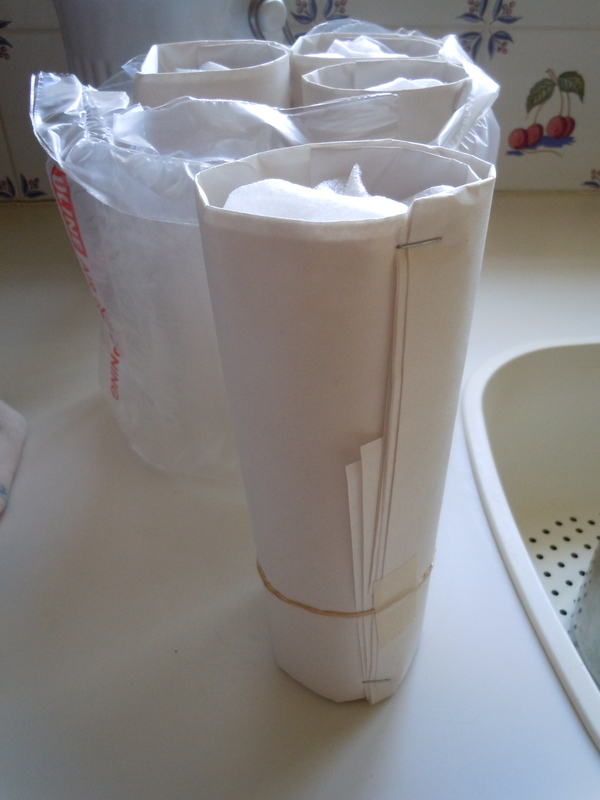 I was astonished at the beauty of the wrapping inside the shipping box! 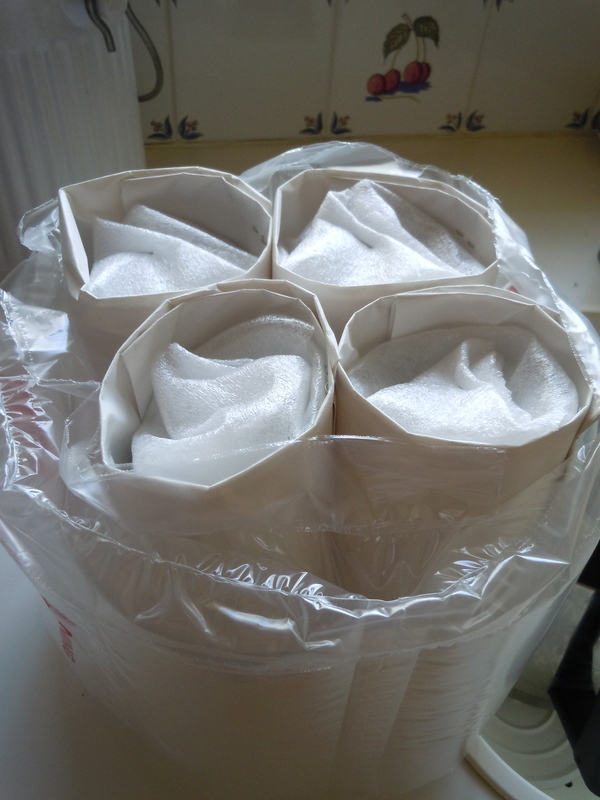 Each small baby arrived in pristine condition! Take a look at their offerings, www.VioletBarn.com. 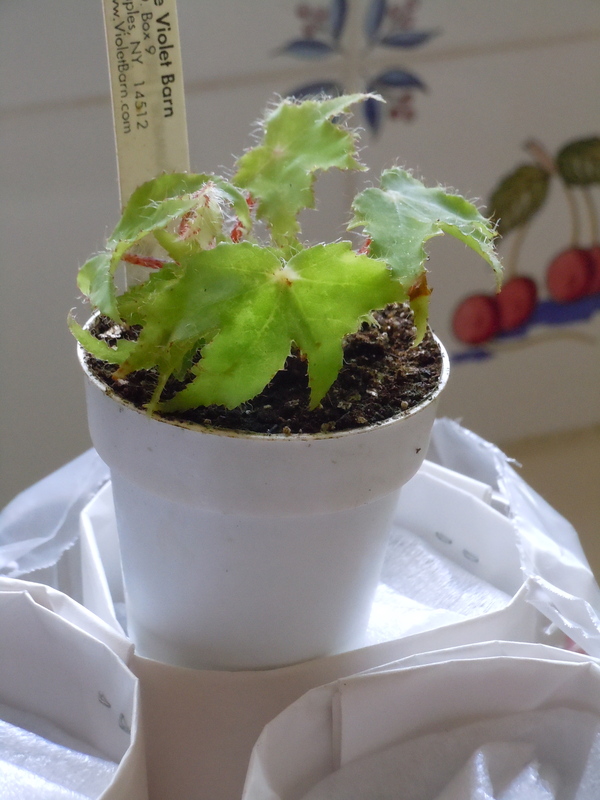 This entry was posted in Uncategorized and tagged Begonia 'Emerald lacewing'', Clematis 'Josephine', Clematis 'Nelly Moser', Rose 'Theresa Bugnet', The Violet Barn. Bookmark the permalink. Hi Jayne – don’t know what has happened but you seem to have disappeared off my blog roll – I will correct it immediately – meanwhile your blooms are bloomin’ lovely – I wish I had as many plants flowering as you – it has been a slow year here. I am sure everything will get going eventually. Your blooms are lovely. The rhododendron is so pretty. And I loved hearing about your Aunt Josephine. The begonias look very well packed. New plants are always so exciting to get in the mail! Very wonderful packaging! I wish all nurseries packed like that. Very lovely Clematis. Greetings Jayne! I enjoyed the freshness of the plants here. I have a definite soft spot for old ‘Nelly Moser’, so good to see it in such great shape! the ceremony, the moment they are no more bride and groom.